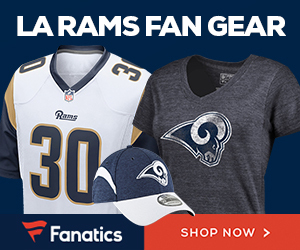 Are the Los Angeles Rams one of the most overrated teams in 2018? Walter Football thinks so! I don’t mind educated predictions that aren’t as positive as mine. He’s an idiot. Probably is a 49ers fan and has them winning it all. We do have a couple of issues, but when Donald arrives don’t we have a better team than we had last year? I mean even with a couple of injuries I see us no less than a 10-6 team. At best I think we could be 13-3, but we do have a tough schedule so somewhere in between should be about right. With the whole Donald thing up in the air and losing a couple key coaches, i’d go with 11-5 this year. Should be good enough to win the division. Walter Football is just missed because they can't call Jarod Goff "Goof" anymore. Seriously his credibility has just taken a nose dive. We massively improved the DB corp adding3 all pros, a superstar DT and a 1100 -1300 yd per season as a wr. Our HC/DC and QB are in their second year under this offense and defense. Our TEs will be better and we showed up our backup Oline with draft picks. Like I keep saying outside of injuries we are a layup for a 13-3 record. No sweat! I like how he conveniently left out the road win at Jacksonville. I guess that wasn't a quality win. Seems angry and way too emotional to be considered a legit analyst. Who the hell is Mel Kiper....I mean Walter Foorball!! Walter has never had any credibility and has always had an unbiased hate for the Rams regardless of their location. I look back at his mock drafts and they are never even close for any team and his buggy click bait, always crashing web site shows how poor of an operation he runs. I would never put any stock in anything Walter Football reports whether it’s positive or in the Rams case usually negative. Who ever he is a fan boy of he is totally clueless on anything sports related. I have to admit sometimes, when I go to my football dark place -- i do think the Rams could be way overrated. Last year was a flash in the pan, everything went perfect, they caught people by surprise, had a weak division,;Goff /Gurley could slip back, more injuries this year, etc....... But then reality comes back and I know that they have a lot of talent on this roster. They are a good team with a good coaching staff. And it is faulty thinking to minimize some of those wins that they had last year, like at Jacksonville for example. From my memory, the MInn game was the only one where they really got totally outplayed. Outside of that they could have won every game. I do agree with Walter that they do lack depth and do play the wrong defense for their talent. I'm disappointed with Phillips for this. I know that you are old but be a little flexible. Coach to maximize the talent. ....,Anyway, these are legit concerns but every team has their share of those. Walter is way too subjective and pessimistic. It seems we acquired a bunch of castoffs that nobody wanted. I see a very talented team behind a competent QB and coaching staff. I went back and watched Vikings game on Gamepass and we didn't really get outplayed here either until we lost our 2 starting corners that was taken advantage of completely by the Vikings, If Cupp never Fumbled at the goal line and those injuries don't occur I think we win that game as well. Bad calls in game versus Philly and we were still in that game. We beat Saints in a game that wasn't as close as the score would indicate. Beat Jax in Jax. Lost to Seahags on a dropped pass. Loss to Niners was due to playing 3rd string guys. This team was a few plays and a healthy defensive backfield from being 14-2 or better last year.